Best View in Brooklyn: "Rescue Me" filming in Sunset Park, so Move Your Car! 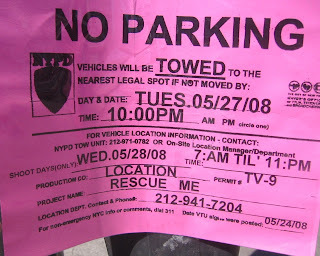 "Rescue Me" filming in Sunset Park, so Move Your Car! Ex-nuns, supposed insurance scams, questionable paternity, and sexual experimentation. Where else but in Sunset? I've never seen Rescue Me, and I was surprised to see that they are currently in Season Four. Congrats! According to the permit, it's a show on TV-9. For the honor of having this Dramedy (with plot-lines like the ones above, could it possibly be a plain Drama? Is it a soap opera?) shot on 5th Avenue, we give up the privilege of parking at the meters between 39th and 41st Streets from Tuesday the 27th at 10 PM through Wednesday the 28th at 11 PM. This has got to be the friendliest "move your car for our snack trailer" sign I've seen yet. It says that vehicles will be TOWED to the nearest legal spot if not moved in time. Wow. That could be a great way to get them to do your alternate side parking for you! Some blocks between 6th and 7th Avenue need to clear out for street cleaning on Wednesday mornings. Maybe someone will try it as their moving method. Of course, the nearest legal spot could be over in Park Slope right now. I wonder if people will turn out to try to glimpse Denis Leary or if the neighborhood will ignore it the same way it ignored the last two film shoots. We'll see on Wednesday, I suppose.